This summer, the EU established strong net neutrality protections for its citizens. After three years of fierce negotiations a broad coalition of activists, journalists, media associations, academics, librarians and startups brought about the enshrinement in law of the principles that make the Internet the free ecosystem of innovative ideas we know today. After the United States of America, Canada, Brazil, India and now the European Union have established similar laws to protect the Internet’s openness, we may be witnessing a global trend. Let us take a step back. What exactly is net neutrality? Just like our roads can be used by all cars (so long as certain laws are respected) and the energy infrastructure can be used by all energy suppliers and consumer devices, the Internet should also be neutral towards the applications and services people want to provide and use. We wouldn’t want a road construction company to lift speed limits for luxurious cars or an energy supplier to power only the devices of a specific brand. Similarly, the Internet is such a general purpose technology, and net neutrality means that Internet service providers must act as a common carrier for everyone and should not interfere with what people can and cannot do online. This neutrality towards which applications are used, together with the Internet’s modular and layered architecture allowed the breathtaking variety of innovations and the diversity in the online world that we can witness today. Everyone with a good idea can rent a server anywhere in the world and forge this idea into a new service that is globally accessible to billions of Internet users from day one. This level playing field of a neutral Internet safeguards competition and freedom of speech. It is also the foundation of all Internet success stories. When Mark Zuckerberg started TheFacebook.com in 2004 with his three colleagues, he did this out of his student dormitory and needed only $85/month for his first server. However, this principle of net neutrality has been increasingly violated by telecom companies around the world who want to offer special treatment in their networks, either to the highest bidder or to their own services. Whenever people called for net neutrality protections, we have witnessed strong lobby pressure from big Internet service providers (Deutsche Telekom, Vodafone, Telefonica), some very big American Internet companies (Facebook, Google) and network equipment manufacturers (Cisco, Nokia). Eventually, in September 2013, the EU Commission proposed legislation – the so-called Telecom Single Market Regulation – that included provisions which would positively abandon the principle of net neutrality. In response, a group of seven NGOs created the first version of the savetheinternet.eu campaign to turn the wheel around and amend this Regulation to uphold net neutrality. The campaign followed the legislative process and then its regulatory implementation over the course of three years and grew to a total of 32 organisations from 14 countries, including the national consumer protection organisations in Germany, Slovenia and Bulgaria. Each step of the campaign required different tactics. In the beginning, the whole campaign was built by volunteers from Vienna without any budget. (From this very first version, all development was shared with the public by publishing the source code on Github.) In a first step, these volunteers developed a tool to allow citizens to send faxes to the personal offices of European Members of Parliament (MEPs) as well as tools facilitating making phone calls and sending e-mails. In a huge attention spike right before the EU parliamentary elections, over 40,000 faxes were sent to MEPs’ offices. This novel instrument proved quite effective as it created a physical token of the citizens’ will and combined an old technology with new issues. All of this was accompanied by in-depth analysis of the legislative proposal, all committee reports and every individual amendment that was brought to the table. Eventually, the European Parliament amended the Regulation to protect against all types of net neutrality violations with a large majority. After the European parliamentary elections in May 2014, Günther Oettinger replaced Neelie Kroes as Digital Commissioner and took over responsibility for the net neutrality dossier. With this change, the tone of the debate also changed. Oettinger’s famous declaration that net neutrality is a Taliban-like issue and various non-factual claims of his, such that self-driving cars require special treatment on the Internet (a so-called specialised service) lead the debate away from the previous fact-based discussions. During the 11 months of negotiations between the EU member states in the Council of the European Union that followed the first reading in the European Parliament, 60 percent of the legislation was deleted by the Council until only provisions on roaming and net neutrality survived. From this moment on, the public debate about the potential end of roaming charges overshadowed the net neutrality issue. The complete lack of transparency in the negotiations between the member states made it very difficult to put public pressure on the often unknown negotiators for the responsible national ministries, who met in secret without any official documents. Yet savetheinternet.eu continued to offer tools to send e-mails to their countries’ permanent representation in Brussels, informed about the process, released position papers, and met with the negotiators of the member states to the extent possible. The Council reached an agreement on 3 March 2015 that provided for better net neutrality protections than the Commission’s proposal, but much worse protections than the Parliament intended. Meetings with negotiators continued during the so-called Trialogue, where Commission, Parliament and Council agreed on the final text. During this entire process the presumed end of roaming charges created huge political pressure for MEPs, who wanted to deliver on this election promise. Some of them were willing to accept any deal on net neutrality so as to get the Council to agree on roaming. In a late night Trialogue negotiation on the last day of the Latvian Council presidency in June 2015, the Social Democrats agreed with the Conservatives on a text that was acceptable to them on roaming, but contradictory and ambiguous on net neutrality. On 27 October 2015, amendments that would have clarified the net neutrality provisions did not reach the necessary absolute majority in the 2nd reading plenary of the European Parliament – the Parliament decided not to decide. Even conservative MEPs agreed with savetheinternet.eu that the Trialogue agreement is vague and contradictory, but none of them wanted to vote for amendments as it would risk the whole Regulation being rejected by the member states. This institutional imbalance is one of the reasons why 2nd reading amendments rarely pass. Although the Telecom Single Market Regulation is an ambiguous law on net neutrality, it can be read to offer safeguards against all types of net neutrality violations if it is properly enforced. Enforcement is the responsibility of the national telecom regulators, who are organised on the EU level within the Body of European Regulators of Electronic Communication (BEREC). The Regulation tasks BEREC to create guidelines that interpret the legislation in order to ensure a harmonised implementation across all member states. Thus, the final battle was to convince the national telecom regulators to create unambiguous guidelines that implement strong net neutrality protections, which is exactly the way in which these protections came about in the USA and India. BEREC started the Guideline creation process with a stakeholder dialogue in which several members of the savetheinternet.eu coalition participated and gave written testimony on how to deliver real net neutrality within the letter of the law. This legal analysis was crucial as all arguments within BEREC have to be based on technical facts or the underlying regulation. In order to assist citizens in participating in this process, the coalition subsequently set up campaigning tools that allowed everyone to express their opinion to the telecom regulators based on a simple questionnaire that was underpinned by savetheinternet.eu’s extensive legal analysis. This legal analysis was then quickly picked up by all other pro net neutrality campaigns. Two more versions of the savetheinternet.eu website and a professional animation video helped the campaign get into this final phase. When BEREC decided on the draft of their guidelines in an ordinary plenary in Vienna, the savetheinternet.eu campaign used this opportunity to organise a very creative public protest in support of net neutrality. When on 6 June 2016 the draft guidelines became public, the BEREC’s public consultation on these guidelines began. Since millions of submissions were made in such a process in the USA and India, the expectations towards the savetheinternet.eu coalition were quite high. However, the EU has no common media landscape, or even a common language, and there are no public figures such as comedians that could explain to everyone on the continent why net neutrality matters, as was the case in the USA and India. Therefore, savetheinternet.eu had to rely on the Internet as a medium for their message, and this worked tremendously well. 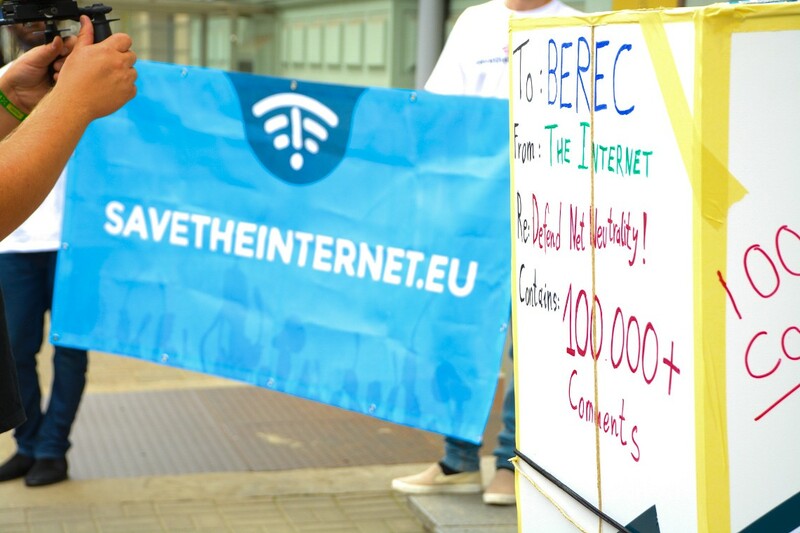 The campaign received a lot of media attention when they personally delivered the first 100,000 comments submitted via the savetheinternet.eu website to BEREC’s head offices in Riga. More protests were held in Bonn, Brussels and Barcelona. In total 510,385 comments were sent to BEREC through the campaign, but only 481,547 reached them in time before the end of the consultation. In their previous consultations, BEREC never received more than one hundred responses, so a total of 510,385 responses is a truly historic number. In relation to population, this brings the EU close to the one million comments that the Indian regulator TRAI received on its first net neutrality consultation. After the submission period ended on 18 July 2016, BEREC had only until 30 August 2016 to analyse the enormous amount of feedback, adapt their guidelines and vote on these changes in an extraordinary plenary session. By then, savetheinternet.eu had gained the support of the biggest Swedish media publishers, the German Journalists Association, the International Federation of Library Associations, 72 NGOs from around the world, 126 leading academics, over 110 founders and entrepreneurs and the inventor of the World Wide Web Sir Tim Berners-Lee together with Stanford Law Professor Barbara van Schewick and Creative Commons founder Professor Lawrence Lessig. But probably most important was the constant legal analysis that the coalition provided in several detailed submissions to the consultation as well as in personal meetings with telecom regulators. The final guidelines prohibit the commercial blocking or throttling of services. A telecom company cannot modify the data stream of a user or block them from using tethering (connecting another device to the Internet using a mobile phone). However, the biggest concern during the three years of the campaign were the so-called specialised services. According to the final guidelines, these can now only be used for services which have nothing to do with the Internet and cannot be abused to sell preferential treatment of regular Internet services. The only unresolved issue is so-called zero-rating – the practice of making certain data more expensive or cheaper than other data. Sadly, this type of discrimination between services on the Internet is not clearly prohibited. Instead, BEREC chose to settle this issue by providing for case-by-case evaluations by the national telecom regulators, as is the case in the USA. Next, civil society has to stay watchful and keep a close eye on the enforcement of the new net neutrality rules by the national telecom regulators. With this new set of rules we have a good toolset to keep the Internet free and open, and if someone comes across a net neutrality violation, they should report it on respectmynet.eu.